The L3 Longsword is evolving from a rugged light attack aircraft into a multi-sensor, multimission platform, as can be seen in the static park this week at Farnborough 2018. L3 Aerospace Systems (Chalet A15) flew this aircraft, which is based on the Air Tractor AT-802U cropduster, from Texas to Farnborough in six hops, and then hung some new equipment beneath it. For instance, a new plug-and-play ISR pod from British company Horizon Technologies can monitor satellite telephone calls, as well as ship movements via the automatic identification system (AIS). 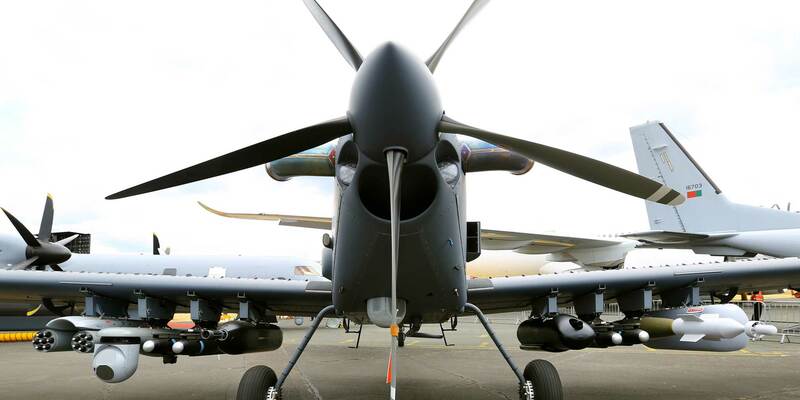 Named the XPOD, it also houses an L3 Wescam MX-15D EO/IR imaging turret. The MX-15D was previously installed beneath the nose of the Longsword, but now a Thales I-Master surveillance radar can be found there, also in a 15-inch turret. Meanwhile, the left outer wing station houses a "Cobra" SIGINT and electronic warfare pod from BAE Systems. The Longsword offers a total payload of more than 3,629 kg (8,000 pounds) from eight wing and three fuselage stations. So the other stations can carry a range of laser-guided bombs, missiles and gun pods. New this week at Farnborough is an Alkan dual 7-cm (2.75-inch) rocket launcher on the right outer-wing station. L3 still awaits a first customer, but at £7.6 to £9.1 million ($10 to $12 million) apiece, the Longsword is a survivable and effective replacement for attack aircraft that cost much more to acquire and operate.